Since Oktoberfest beer season is upon us, here is an entry from 2011 about Oktoberfest beer. Here it is the middle of August and we are seeing the signs of fall on our beer shelves. I have seen a number of Oktoberfest and pumpkin ales appearing already. If you did not know, Oktoberfest is a German festival that dates back to 1810. It is held in Munich and lasts sixteen days — ending with the conclusion of the first weekend in October. So really, most of Oktoberfest actually takes place in September – this year (2011) it begins on September 17th and ends on German Unity Day on October 3rd. The festival begins with the traditional tapping of the first keg by the Munich mayor. Amazingly, about 1.8 million gallons of beer are consumed during the festival. Only beer brewed within the city of Munich is served at the festival and they include six names that are familiar to US beer shelves: Hacker-Pschorr; Paulaner; Hofbrau; Lowenbrau; Augustiner and Spaten. So, if you are looking for authentic Oktoberfest beer — look for offerings from these brewers. Like a lot of Oktoberfest beers, the traditional lager is called “Marzen” (translates to March). Since summer’s heat wasn’t conducive to producing (or storing) beer, this traditionally malty ale was brewed in Spring and consumed all summer long. The inventory spent the summer stored in caves and cool places. The alcohol level was also elevated to 5 – 6% to prevent spoilage. The remaining beer was consumed when the brewing season resumed in fall. So — essentially Oktoberfest is basically the equivalent of a big fridge purge. I’m going to try and give a quick opinion on as many of the “big 6” Oktoberfest beers listed above. A lot of beer from mainland europe have that same distinctive skunky aroma and taste — and that’s what I get right off the bat. Once again, a light green bottle might be the culprit here as light is beer’s enemy. Very carbonated with large bubbled white head. The skunky flavor is a flash and it subsides to reveal a sweet lightish malt that is quite pleasant and right behind comes a crisp and bitter finish. This is more of a traditional German pilsner and not one you would think to pick out as a brew made for such a momentous festival. I could see enjoying this out in the hot sun in Munich — I’ll give it 85 points. Although it’s a Marzen/Oktoberfest – it’s also described on the label as a malt liquor. As mentioned in another post a malt liquor is just a beer with a high ABV — and years ago 5.9% was considered quite high. This one pours a light ruby brown with grayish white head that goes still quickly. It’s clear and you don’t see any carbonation — but it’s quite evident with my first sip — fizzy. It’s light in body and light in flavor. Slightly sweet and somewhat herbal. I don’t think I should have to concentrate on finding flavor – it should be self-evident. I’m not that impressed, 72 points. So, the Oktoberfest festival ends tomorrow with German Unity day. Like other European breweries Hacker-Pschorr can trace its history to the middle ages — 1417 to be exact to the Hacker brewery. Joseph Pschorr bought the brewery from his father-in-law in the late 19th century and established a separate Pschorr brewery under his name. It wasn’t until 1972 that the familiar name was born. You’ll even note that the logo on the bottle carries the symbols of both breweries. Admittedly, this is an annual purchase for me. One other quick label note – 5.8% ABV (right where you’d expect it to be). This Marzen pours a clear brown with a off-white head. The whole beer goes still pretty fast. Nice sweet nose — definitely get the pilsner malts coming through. That same maltiness follows through on the first sip. I describe German pilsner as a sweet skunky flavor. Really its a caramel over a subtly bitter hop (Alpha Acidity — or bitter hops are mild in Germany). Really nice mouthfeel, finishes very crisp. A lot of similarities with Hof Brau’s version — except Hof Brau was a notch sweeter – and this one looks like a fall beer should look – brown. I’ll put this one at 88 points. As mentioned there is “the big six” among Munich Oktoberfest beers — This is my fourth from that group. I suspect that Lowenbrau and Augustiner will be hard to find but, I’ll keep looking. This one is also 5.8% ABV. It is also one of my contributions to the “pop-swap” this month. Our theme is Black and Brown. Craig argued that this shouldn’t qualify as brown — but after I pour this one — it’s definitely brown. Looks remarkably the same as the Hacker-Pschorr pour. It’s clear brown and quite still. A little fizzy on my first sip. The sweetness of the pilsner malt is subtle — almost too subtle. I’m picking up some biscuity bread flavors before a very awkward buttering hop closes this one out. I’ll have to put it well behind Hof Brau and Hacker Pschorr — at 80 points. Gritty McDuff’s (a.k.a Gritty’s) is a legendary regional brew pub that was founded in Portland, Maine’s Old Port in 1988. Today, they operate three brewpubs in Portland, Freeport and Lewiston/Auburn and distribute in several northeastern states. Gritty’s is celebrating their silver anniversary with four limited offerings in 2013. This beer – S.O.S, or Special Oatmeal Stout was the first installment released April. They followed with an ale called Big Blonde in May and according to their website, releases three and four are promised for this fall. Oatmeal isn’t a flavor you would pick up in an oatmeal stout because a brewer’s aim is for the proteins, lipids and gum found in oats to lend a viscous, creamy texture to beer. This beer contains about 10% oat flakes. In the 17th century there were beers made with 35% oats – but it was documented that the resulting brews were bitter beyond consumption. It seems that the term oatmeal stout was popularized in the late 18th century during a time when oatmeal was popularized as a health food. I guess it’s the modern equivalent of adding “a great source for anti-oxidants” to the labels of products – no significant substance, all marketing ploy. We see Russian imperial stouts reaching alcohol by volume (ABV) levels of 15% plus. Oatmeal stout usually falls in the 6% to 8% range and Gritty McDuff’s S.O.S slots nicely in the category at 6.9% ABV. The pour is cola brown and the khaki-colored head dissolves quickly. Roasted aroma like chicory on the nose. I get a yeasty banana flavor right up front and that hits me as odd, it is present in every sip, but does get overrun with potent bitter roasted flavor like burnt toast. The roasted flavor is pleasant at first, but wears out its welcome pretty quickly. This one finishes with an odd burnt plastic undertone. A bit too carbonated, astringent and not as lush as I would expect. I’ll move on with something else, 74 points. Another pair of labels scream out from the shelf….”buy me! 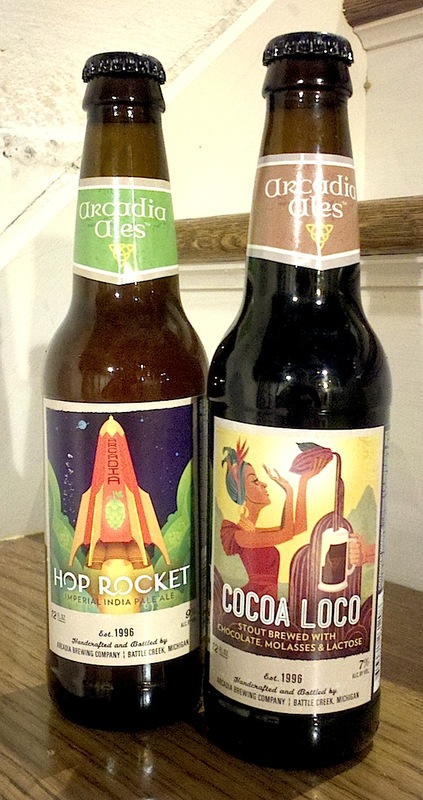 buy me!” Beyond the cool depression era styled poster labels, the descriptions are hard to resist – “made with chocolate, molasses and lactose” and an IPA with a 9% ABV and a reported IBU of 111. I’d love to dig in a little more on these offerings – but I’m about to get the “can’t you be doing something better with your time”. So, my lack of time will require me to jump right in. Their site says that my experience should be “grapefruit, lemon peel, spruce and cellared mushrooms. Although the flavor focuses on hops, a trio of malts balances this beer to a delicious level of palatability with hints of caramel, toffee and freshly-baked biscuits”. I can’t say that I’ve ever heard of cellared mushrooms in a flavor description. It’s a fungus. Actually, first sip, brings most of what they’ve advertised — grapefruit, lemon, spruce . I don’t get the caramel, toffee or biscuits. The mushroom flavor is odd but I’ll call this one totally unique. It’s a bit boozy and I’m not sure the mushroom flavor is something that I would seek out. The flavor is all up front with very little on the back end. I can’t see this as 111 IBU – that’s Stone Ruination territory and I just don’t see it. I’ll put this one at 85 points. A few sips in and I realize that I have to stop listening to these labels. It has a roasted punch up front – but all the advertised chocolate, molasses are non-existent. The lactose, or milk sugar, should lend a creamy mouthfeel — but that doesn’t happen. A bit too much carbonation and the alcohol even at 7% pokes in a bit too much. 73 points. Sorry — time to move on to something else. I’ll mark the start of the craft beer uprising at about 30 years ago – say between the founding of Sierra Nevada in 1979 and the launch of Sam Adams in 1985. However, I think there was a very unremarkable period of craft beer that lingered through most of the 1990s. After the initial shock and awe, craft beer just didn’t get better. At least, it didn’t captivate my interest. Every craft beer seemed to be a carbon copy or worse. I started exploring wine and became a pretty good wine enthusiast and along the way amassed a nice wine collection of about 400 bottles. In the early part of this past decade, I started checking back in on craft beer. The problem was that I had lost my way. Labels and brewers were unfamiliar. 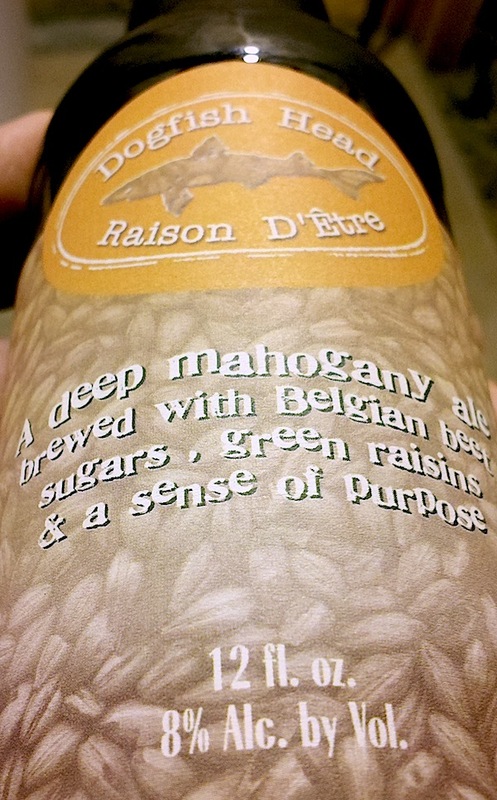 I saw this beer from Dogfish Head in (I guess) 2001 and saw that it was voted the best beer of the year 2000. I decided to give it a go. Frankly, I didn’t like it. It was full of raisin and dark fruit flavors. I didnâ€™t get the raison/raisin connection. But one important thing came to me – beer was headed in the right direction. Over the last ten years my wine collection has vanished and I’ve seen some great innovation in beer. I’m excited to see a number of new breweries and expansion of some of my favorite breweries. However, I have lived through one period of “stagnation over innovation” and hope that the creative boundaries will continue to be pushed. Anyway, I haven’t had this beer in eleven years, so I think I owe it some recognition for rekindling some of my interest in craft beer. The French name translates to “reason to exist”. I’d say that’s a pretty lofty expectation for a beer. Amazingly still and mahogany in color as advertised. Belgian yeast spice influence up front. Some mild dark fruit and some odd tartness on the finish. Flavor is light, body is light and my enjoyment is light as well — 70 points.